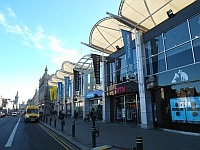 The venue is situated within the centre of the town or city. This venue is situated in Aberdeen. The nearest mainline station is Aberdeen. Parking is not free for all users. The car park is located on Rennie's Wynd. The car park type is multi storey. There is/are 7 Blue Badge parking bay(s) within the car park. The dimensions of the Blue Badge parking bay(s) are 380cm x 480cm (12ft 6in x 15ft 9in). The nearest Blue Badge bay is 8m (8yd 2ft) from the main accessible entrance. The furthest Blue Badge bay is 20m (21yd 2ft) from the main accessible entrance. The car park does have a height restriction barrier. The maximum height is 188cm (6ft 2in). The main doors open automatically. The automatic doors are push pad activated. The door opening is 160cm (5ft 3in) wide. The door opening is 180cm (5ft 11in) wide. The ramp or slope is located leading up to the entrance from Union Street. The ramp or slope is easy. The width of the ramp or slope is 500cm (16ft 5in). There are not steps to access this area / service. You are on Outside Access (Union Street Entrance). Skip to the next section. There is a small raised threshold in the doorway. There is not a second set of doors. You are on Outside Access (Car Park Entrance). Skip to the next section. This information is for the entrance located at the side of the building from the car park. The door opening is 106cm (3ft 6in) wide. You are on Outside Access (Bridge Street Entrance). Skip to the next section. The door opening is 165cm (5ft 5in) wide. You are on Level Change (Bridge Street Entrance). Skip to the next section. The ramp or slope is located leading up to the entrance. You are on Outside Access (Guild Street Entrance). Skip to the next section. The main doors open both ways. The door opening is 170cm (5ft 7in) wide. You are on Level Change (Guild Street Steps). Skip to the next section. The ramp or slope is located immediately after the steps, leading up to the entrance. The steps are located leading up to the entrance from Guild Street. There is / are 15+ step(s) to the area / service. The handrails are on both sides. This venue does play background music. The floors which are accessible by stairs are 2-3-4. 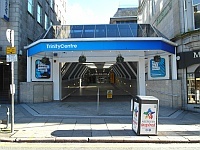 The lift is located at the rear of the shopping centre. The floors which are accessible by this lift are 2-3-4R-4L-5-6. The lift is 10m (10yd 2ft) from the accessible entrance. The dimensions of the lift are 170cm x 185cm (5ft 7in x 6ft 1in). There are separate entry and exit doors in the lift. There is not a mirror to aid reversing out of the lift. The lighting level in the lift is bright. Please note that there are three standard lifts, all have the above specifications. There are accessible toilet facilities within this venue. The toilet is for the sole use of disabled people. 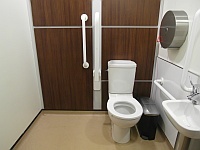 This accessible toilet is approximately 17m (18yd 1ft) from the accessible entrance. This accessible toilet is located on level 2. 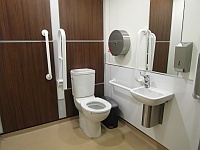 The dimensions of the accessible toilet are 170cm x 180cm (5ft 7in x 5ft 11in). There is sufficient turning space in the cubicle for a wheelchair user. The lateral transfer space is 90cm (2ft 11in). The emergency pull cord alarm is fully functional. There is a/are general domestic waste disposal units. The height of the toilet seat above floor level is 48cm (1ft 7in). There is not a towel dispenser. The contrast between the external door and wall is fair. The contrast between the internal door and wall is fair. The contrast between the wall-mounted grab rail(s) and wall is poor. The contrast between the dropdown rail(s) and wall is poor. There is an intercom beside the toilet to unlock it for entry, operated by CCTV. The female toilet facilities that were surveyed are located on level 2. The female toilet(s) is/are approximately 13m (14yd 8in) from the accessible entrance. Inside the venue, there is level access to the female toilet(s). The male toilet facilities that were surveyed are located on level 2. The male toilet(s) is/are approximately 14m (15yd 11in) from the accessible entrance. Inside the venue, there is level access to the male toilet(s). Baby change facilities are located beside the toilets on level 2. The height of the baby change table once extended is 87cm (2ft 10in). 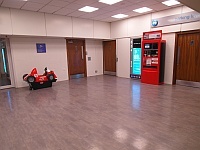 Inside the venue, there is level access to the baby change facility. Documents are not available in Braille. Documents are not available in large print. This service cannot be requested. These photographs show the baby changing facilities.